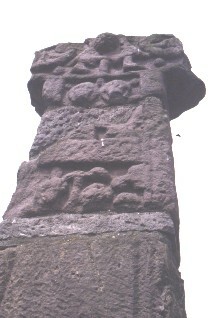 The Cross Head has the lower part of a figure in the centre of it. At the top of the shaft there is a panel which is difficult to identify. It is thought that it represents the Baptism of Christ, New Testament, Matt. 3; Mark 1; Luke 3; John 1:32.